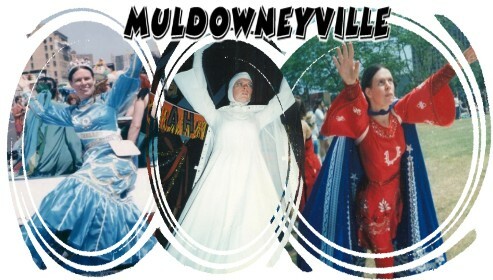 Salutations and welcome to Muldowneyville, the marvelous world of performance artist & Interpretive dancer Suzanne Muldowney. She is known for her amazingly researched character interpretations like The superhero Underdog and her dance renditions of Draculas historical persona Vlad The Impaler. But she does so much more. Here youll meet Suzanne the baker, the seamstress, the writer, and Suzanne the philosopher. We highly encourage people to send Sue questions and we'll try to have Suzanne respond and write back on this forum. Suzanne Hospitalized After Vicious Cat Attack! On July 10, 2009 I got a dilute calico cat that was named Tupac but I was going to call her Venus because of the date on which she was born in 2004. She was to replace my 2nd black cat, Ebony, who died March 15th this year due to kidney problems. The cat was recommended to me by Boris who directed my documentary. Tupac's owners were friends of his. When Boris and the couple had left the cat alone with me on July 10th, she immediately went into seclusion instead of wandering around the apartment to get used to her new surroundings. Obviously, she was very frightened. Because she hid herself I feared she would go to the toilet in the wrong places. The next day was Saturday the 11th; I put her food and litter pan and water supplies in the bathroom. Saturday night she was under my bed. I pulled her out from there, picked her up, and carried her to the bathroom where I locked her in. but before I could close the bathroom door she had inflicted multiple bites on my right index finger. I managed to keep her locked in the bathroom on Saturday night, but Sunday morning she had somehow forced the door open. It was better to leave her alone rather than to round her up, let alone touch her. My injured finger was swollen and infected. But I could not see a doctor until Monday. When I did so, the doctor said I had to go to the hospital's emergency ward. When I went there, one of its doctors coerced me into overnight hospitalization. I was greatly alarmed because that would greatly disrupt my schedule, and would be greatly expensive and would leave the cat in the lurch. I ended up being put through many procedures and being made to stay longer and longer. I had to have surgery on my infected finger on Wednesday. The latest, I was told, was that I would be released on Monday the 20th. I informed the cat's former owners what had happened. They will reclaim her. People who are old enough to remember the old-time Underdog cartoon stories may recall one called "Pain Strikes Underdog". In that story, however, underdog was not required to change his clothes to hospital patient guards. Otherwise, the doctors would have found the sword inside his cape and solved the mystery of his pain immediately. It was also inappropriate that Polly was on his heels every minute when he was being transported or when he was in the operating or examination rooms. It's against hospital rules for visitors to be in those parts of a hospital. So, a real case of Underdog being hospitalized debunks many misconceptions about hospital policies or care procedures created by the cartoon story "Pain Strikes Underdog". Also this year is Underdog's 45th anniversary! She will be wearing her special sapphire cape for this year to commemerate it! There's a lot of talk about this new Underdog film and Suzanne's opinion. She has forwarded me this press statement to post immediately! On August 4th we were on the streets of NYC to see the movie and ask what people know about Underdog. We'll be reviewing it on the Checkerboard Kids Program! On Friday, August 3, 2007, a motion picture will premiere which, unfortunately, puts me in a very awkward position. The movie is based on the fictional character I am best known for portraying: Underdog. Ever since 1966, and especially since 1980, I have been impersonating this TV-cartoon superhero, who originated in 1964, through theatrical dance. I started in science-fiction convention masquerades, then went on to staged variety shows, TV talkshows, and especially parades. In May 2006 I was on the national TV show Jimmy Kimmel Live; the host specifically requested that I make an Underdog appearance. 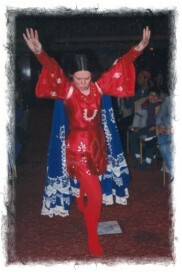 Also in 2006 premiered a documentary about my performing career and interpretation of the character: My Life as an Underdog, which can be looked up on MylifeasanUnderdog.com. Despite these accomplishments, I fear I will be totally overlooked and eclipsed by this upcoming feature film. Society makes movies too important a medium in terms of propagating a concept or story. A topic is not considered significant unless it is the subject of either a movie or a TV show. The public is forewarned that the outfit behind this movie, Disney, typically takes topics not created by it, and making any changes or makeovers it feels like, so that the end product is a far cry from the original, but is mistaken by the public as infallible, gospel. 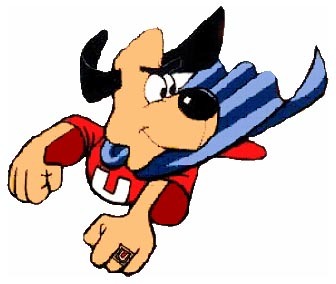 The character of Underdog was created as a cartoon canine equivalent of Superman, since he had much the same powers, especially the ability to fly. However, like the 60s Batman TV series, the Underdog series was flawed by simplistic and unrealistic plots; simplistic dialogue; lack of intelligence among characters; illiteracy; melodramatic narration; general silliness; and high degrees of violence. As a child, I was stunned when I was force-fed the dictionarial meaning of the word "underdog": born loser; and forced to acknowledge the above character and programmatic flaws. I was further intimidated and humiliated when force-fed the notions that Underdog was strictly a parody of Superman; and that unless he was presented in a dignified, realistic, and meritorious manner, he was inappropriate. Having been thoroughly shaken, I have always made a point of portraying Underdog along the lines I had been told were the only "right" ones. I have earned respect for both the character and myself as a result. But I fear only the worst from this upcoming movie which threatens to eclipse even my own movie, listed above. The ads for the Disney movie contain a blasphemous parody of part of the Pledge of Allegiance: one nation under dog. 1.) The filmmakers would receive a lot of attention and credit for allegedly resurrecting the character of Underdog, or re-inventing him. In all that media hype, the public would forget, or refuse to believe, that I exist and have been portraying Underdog for several decades. 2.) If the plot does not do the character justice, if it contains any or all the same flaws as the cartoon stories did, the public will have no regard for him and will forget, or refuse to believe, that I portray him in a dignified and meritorious manner, with sensible stories. 3.) If the film is rated "Fair" or "Poor" rather than "Good, "the public will have no regard for either it or the character, as in #2, and will leave me in the lurch. 4.) The film's being rated "PG" bodes ill. Such a rating automatically means that some content is inappropriate for children, when the character was originally created for children. Any film content that is not family-friendly will cause both the character and me to lose face with the public. 5.) If the film is a big hit, there will be a lot of commercial and media hype. Casts and crew will appear on TV talk shows; relevant toys and other merchandise will be fostered; Underdog impersonators will appear in Disney theme parks; and, as in #1, many people will be given undeserved hero worship and false godhood. The public will be so eager to jump on the bandwagon that they will forget, or refuse to believe, that I am still around and have been active for several decades. 6.) If the film is a flop, the public will hold both the character and me in contempt, as in #2 and 3. They will refuse to consider my documentary. I cannot bring myself to believe that I will reap any benefits from the showing of this movie. Twice in the 1990s, the original cartoons were rerun on cable TV. But they only repeated the original character and programmatic flaws before the next generation of children and-more importantly-no connections were made to me. The public is urged not to let themselves get carried away by the release and presence of this film which rivals, and threatens to ruin, all my conscientious efforts to keep a superheroic character, plagued by buffoonery and negative naming, worthy of merit and respect, since I was forced to see only the negative while I was growing up. I saw the movie commercial, last weekend and here are my notes on what I saw! * Underdog, Polly and Riff Raff are ordinary dogs walking on all fours wearing no clothes and piped in voices. * Underdog himself is not called Underdog the beginning when acquires his powers Through what's seems to be some sort of power plant accident, He has a has a human owner named jack who puts him through a hero training program. During this Underdog seemed to crash through some separators thus damaging property which is a programmatic flaw. * This Underdog wears a cape red shirt with a letter "U" but no pants! * Please do not expect me to move on all fours without legware! The 2007 Coney Island Mermaid parade in New York was the place where Suzanne revealed her her newest mermaid costume. She calls her "Sylvia" please send us if you have any pictures! Hard to belive Underdog hit the airwaves 43 years ago! This Thanksgiving will be the 42nd anniversary of the Underdog baloon! Old school public access show Beyond Vaudeville lives! It has a new Myspace page! Humble host, Frank Hope has a brand new interview with Suzanne that you can read here! You can also get their DVD with old school Suzanne footage on it! On 5/22/06 Suzanne had a lovely time on the Jimmy Kimmel Live Show! Everyone was respectful and really enjoyed what she did! Hopefully they'll have her back again! If you 'd like to see her performance click here! If you'd like to see her interview with Jimmy Kimmel click on his name. Suzanne has donated 6 costumes to Baltimore, MDs Visionary Arts Museum! Julius Ceasar (Military Garb) as seen in "My Life as an Underdog"
Balencercise Uniform (Balencercise is another Sport like figure jogging that has been invented by Suzanne. She got the idea from balancing gymnastics but no somersauts or tumbling involved. the body stays upright at all times.) 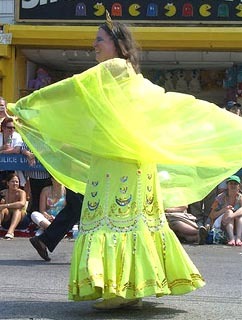 Green costume with white and yellow daisy motifed appliques. Skin colored tights. How Does Suzanne Make Her Costumes? It's Official! Suzanne took 3rd Place honors (Best Mermaid) at Coney Islands 2005 Mermaid Parade! The Underdog 40th Anniversary stats are in! Prepare thyself! Sue's already planning for the 45th anniversary in 2009, She says sapphires are the symbol of 45th I assume this will become a possible motif in her costume. Stay tuned! Sue is always looking ahead! For her 25th Coney Island Mermaid Parade in the Summer of 2007 Suzanne will unveil a brand new mermaid character dressed in a specific color to suit the occasion! I will say no more! Suzanne Muldowney awarded "Best Honorary Baltimorean" according to Baltimore's City Paper! On January 29th she was presented with a citation by a representative of the mayors office The Baltimore Cable Show "Port Discovery" had Sue come on and dance. At the shows end they had Irish folk dancers. Sue joined them as Underdog but specifies she did not dance the same movements. There was also a birthday cake wishing Underdog a belated 40th anniversary. Yes, Suzanne saw the commercial! She recounts: "This is the first time Underdog had been used in a commercial since "Frosted Cheerios in 1995! I recognized Captain America and Spiderman. The live action commercial then had an animated Underdog. I felt the commercial tried to make it seem that he had appeared too late. The commercial didn't involve me at all." Would it have been a better commercial if she had been in it? "Probably!" retorted Suzanne. Suzanne's Beyond Vaudeville episode guide! 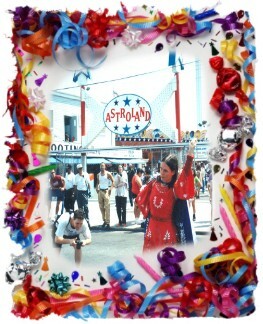 Photos by Deborah Samantha Olin of Suzanne marching in the Coney Island Mermaid Parade 2004 can be seen here! This year is Underdogs 43nd anniversary. Suzanne will definitely be touring, performing as this character. Check our schedule and updates of where you can see her next. Feel free to send photos and write in experiences you may have had seeing Sue at an event or function. Speaking of Art projects, Since it is a Olympic year Suzanne asks all you artists out there to peruse UNDERDOG: INTERPLANETARY OLYMPIC HORROR and send us an interpretation of your favorite scenes and we will put them up on the website for all to see on our artwork page! Special thanks go out to Discoman Doug Kramer, Boris, Christine B, The Masked Mutant, Ed at Media Funhouse, Sal Piro, Jake Squirt, Marcia at Making The Scene, The Coney Island Sideshow, Atomic TV, The great folks at MNN and praise due to the cast and crew of Beyond Vaudeville the greatest public access show there ever done was. Q: Just who are you anyway ? A: My name is Phil, I first saw Sue on the Beyond Vaudeville program. I was a guest several times on the show. The hosts introduced me to Suzanne after a live show and we became fast friends, 13 years later weve worked on projects, hung out and went to parties and parades. Sue has a dream that she wants everyone to know about her opinions and intentions. So I present it all here for free. A clearing house of all things Suzanne. So if you have, share! Add to the legend. If you use anything from our site, acknowledge. Link us and get the word out. We are just a humble fansite so please dont sue us! We po'!